So the time has come for you to update your home, but you have no idea where to start. Luckily for you, Wayfair happens to be having a gigantic sale at this very moment, and it’s up to you to take advantage of it. Everything featured in the sale is under $99, and we mean thousands of modern home furnishings, area rugs, outdoor furniture, kitchen and dining accoutrements, office furniture, and so much more. But where do you begin? Don’t worry, we’ve done the hard work of scouring the sale for you and picked out the best items for you to take home. And the best part is, you know you can afford every single item on this list because the highest possible price point is $99. Maybe you’re planning on updating to a more modern-style kitchen, so you’re in the market for metal and chrome? Or perhaps you’re seeking a bohemian vibe for your bedroom and you want tasseled poufs, hand-dyed window treatments, and Oriental area rugs? Wayfair definitely has you covered from top to bottom. Here are 15 of our top picks from Wayfair’s massive sale, but don’t stop there. See what else the sale has to offer. If you were planning on redecorating or replacing your kitchen essentials, now is definitely the moment! This bright blue end table has a school-days charm about it. It’s a modern piece that will add a pop of color to an otherwise neutral room. The wooden end table features a single drawer with a metallic pull handle, perfect for hiding any and all remote controls. Buy it on Wayfair for $67.40. A textured pouf is a perfect accessory for your living room or bedroom. Use it to add visual interest and a sense of coziness. Use it as a footrest when you’re bingeing your favorite Netflix series, or place a mirrored tray on it and use it as a convenient surface to hold a perfectly mixed drink. Buy it on Wayfair for $97.99. Take your couch someplace exotic by adding a few beautiful accent pillows to the mix. This decorative throw pillow features a horizontal stripe with a unique tonal geometric print. The hidden zipper closure adds to the overall functionality and aesthetic. Buy it on Wayfair for $29.99. Upgrading your bathroom to feel modern is all in the details. That’s why this sleek faucet is such a great find. It features a short single-handle lever and a ceramic spout. We love that it looks similar to a vintage water pump while remaining current in its design sensibility. Buy it on Wayfair for $62. 23. Since the weather is almost certainly cold, snowy, or rainy for some portion of the year, you’re absolutely going to need a doormat. 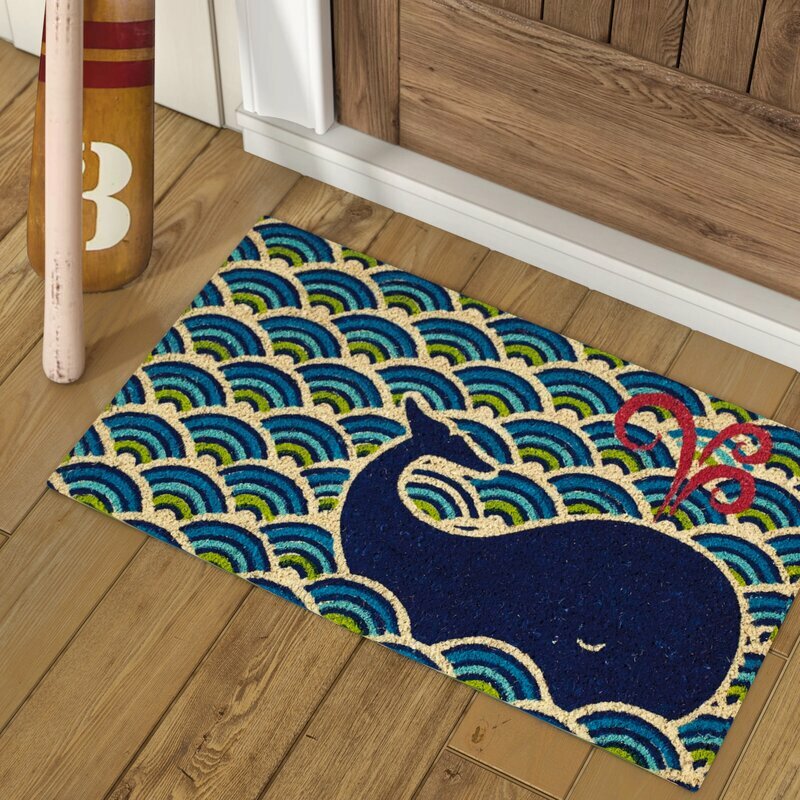 But why go with something boring when you could pick up this adorable whale doormat in a fun, quirky design? Buy it on Wayfair for $28.99. Not only do rugs add visual interest to a room, but they also add warmth and insulation. Imagine stepping from your warm bed after a good night’s sleep onto this lovely round area rug featuring an intricate floral pattern in cool blues and shades of ivory. If you’re obsessed with the mid-century modern design craze, this Danish-inspired coffee table is bound to be right up your alley. Featuring a sleek, minimalist design, room for storage, and smooth wooden legs, it’s a perfect addition to any space. Buy it on Wayfair for $71.99. Add a touch of whimsy to your bedroom with this sweet floral quilt set from Wayfair. The hand-painted floral design is just stunning, and there’s a solid color option on the reverse side for when you crave a more subdued look. The set includes shams and the quilted coverlet. Buy it on Wayfair for $61.99. A touch of modern art makes any space feel more fully realized and like you’ve put some thought behind what mood you want your home to evoke. This moody blue modern art is a stunning accent piece for any living room, kitchen, or den. The dimensions are 36 inches high by 24 inches wide by 1.5 inches deep. Buy it on Wayfair for $46.38. The addition of a comfortable chair to your bedroom is one of the best decisions you’ll ever make. Instantly you’ve got a place to read, sip tea, and look out your bedroom window in peace and comfort. This paisley style is such a beautiful option. Buy it on Wayfair for $84.99. Bring the desert vibes of the Southwest to your kitchen decor with this quirky cactus vase. The subtle sage hue will look picture-perfect on your family table, and you can choose a lovely new floral arrangement to adorn it each week. Buy it on Wayfair for $23.28. The beautiful motif on this dishwasher-safe and microwave-safe stoneware dinner set is inspired by the exotic textiles of Morocco. The set includes four dinner plates, four salad plates, four mugs, and four bowls. Imagine serving up a delicious meal to your friends and presenting it on this unique dinner set. Buy it on Wayfair for $69.99. Perhaps your trusty cookware set is in desperate need of replacing? Now’s the perfect time to upgrade and replace your pots and pans with this 10-piece nonstick cookware set, which features one small frying pan, one big frying pan, one small pot, one medium pot, one steamer, and four lids. Buy it on Wayfair for $96.99. Not only is this lovely ceramic piece beautiful, but it can also be used in any scenario. Use it as a small table in your bathroom, as an outdoor gardening stool, or as an accent table in your living space. Buy it on Wayfair for $74.48. There’s no reason your cookware should be boring or basic. Cast-iron Dutch ovens are an absolute favorite among professional chefs and experienced home cooks, and this gorgeous red one will look stunning on your stovetop. Smell the simmering scents of chicken, root vegetables, beef, and potatoes as you come up with hundreds of one-pot recipes using this classic kitchen essential. Buy it at Wayfair for $55.99.